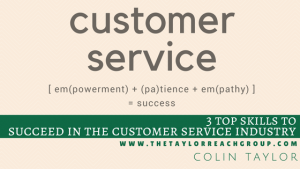 3 Top Skills to Success in the Customer Service Industry | The Taylor Reach Group Inc.
1) Empowerment: We are the experts, that is why the customer is speaking with us. The customer expects that we can take ownership of their issue and look after them to resolution. Customer service is everyone’s job and when you interact with a customer, it is your job to own the issue and get it resolved. 2) Patience: Each customer is different and their journey that brought them to speak with us, has nuance and variation. If we are not patient we run the risk of guessing what the customer is seeking and both wasting time and frustrating the customer. 3) Empathy: We need to understand and appreciate the customer perspective. While it may be one of 50 customers we interact with today, each customer has their own concerns, perceptions and perspective on their experiences. Every customer has something they are seeking to achieve through the interaction and we need to be empathetic and understanding their situation. Feel free to join the conversation and share your insight on what you believe to be the top skills for success in the Customer Service industry.